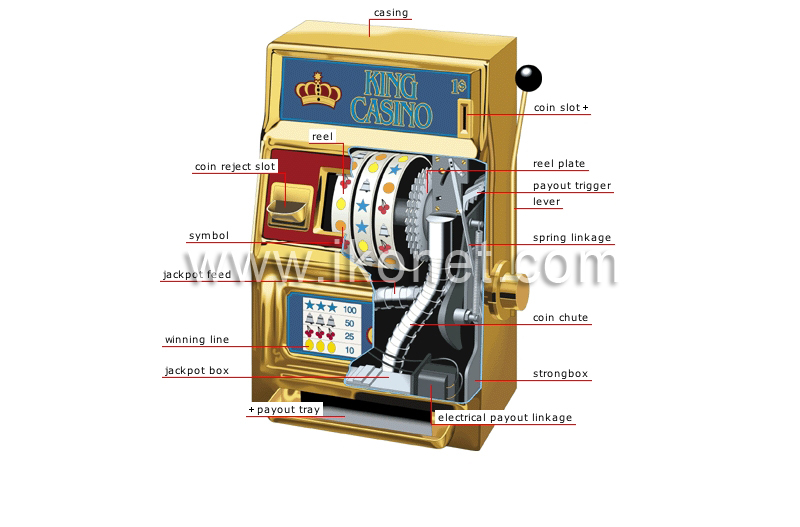 Electronic or mechanical gambling machine that is operated by inserting a coin into a slot in order to obtain a sequence of winning symbols. Tube that deposits some of the coins inserted into the slot machine into the jackpot box. Device used to determine the amount of the payout. Metal covering that protects the machine’s internal mechanisms against theft. Box containing the coins for the slot machine’s top prize. Tube that deposits coins into the payout tray when a player has won. Device that activates the reels. Cylinder inscribed with symbols that is activated by the machine’s lever; when the three reels stop, the symbols line up to create a combination. Toothed wheel that stops the reels. Mechanism used to dispense coins when a player has won. Plate onto which the player’s winnings are dispensed. Display showing the combinations of winning symbols and the winnings to be paid. Small hole into which rejected coins fall. Shape used to create combinations. Device connected to the spring linkage to activate the reels. Opening through which coins are inserted into the machine in order to play.